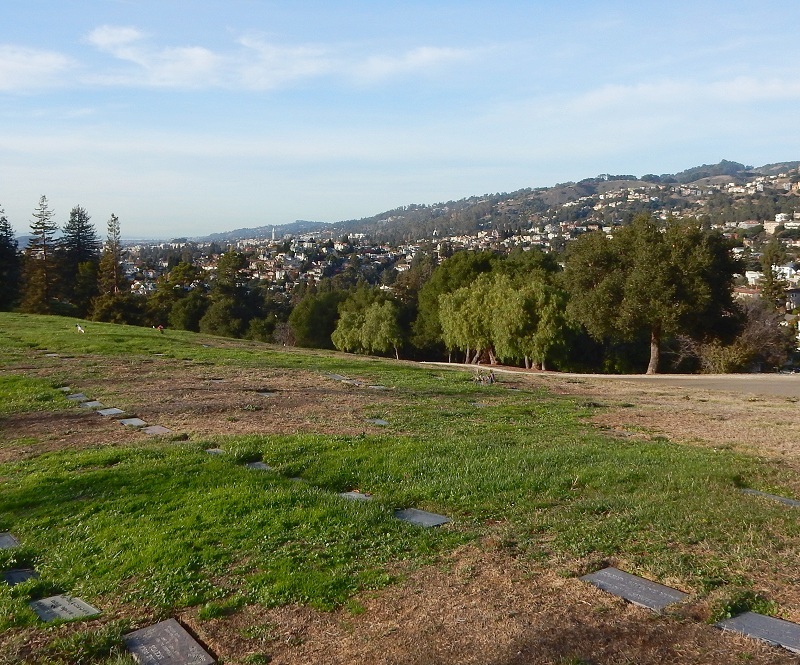 Mountain View Cemetery is a never-failing source of interest. If you tire of graves, then why not collect the knockers exposed in this splendid preserve of Franciscan melange. I haven’t featured them here in several years, but recently the weather up there was especially photogenic. The one above, near the north edge west of the Cogswell monument, is my favorite, but they’re hard to choose among. Let’s say that knocker 1, my “secret chert,” is my favorite in the civilized part of the cemetery. As you climb the hills, it’s natural to look around, away from where you are. 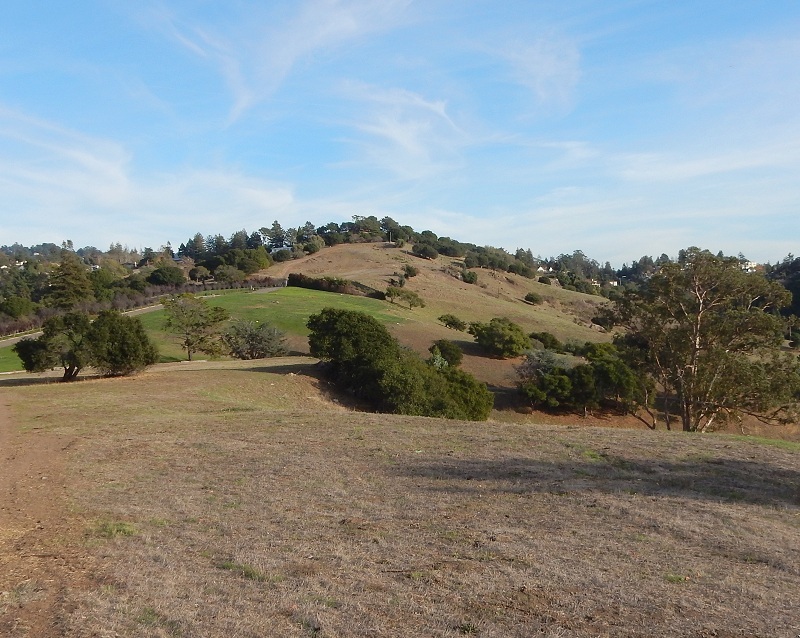 Lately the cemetery managers have eliminated the overbearing fringe of eucalyptus along the rear, and the views north are enticing. 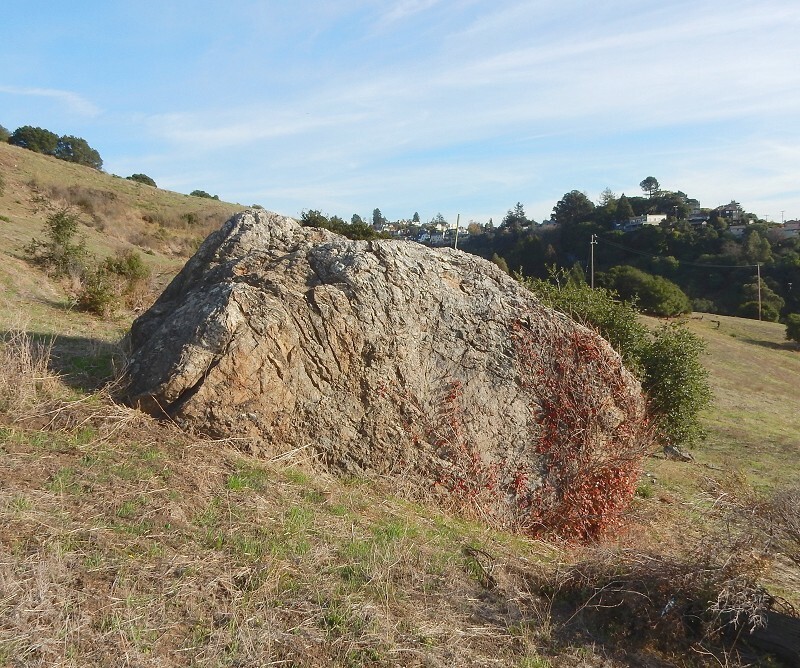 If you look carefully, maybe you can spot Cactus Rock, a leading candidate for the mysterious Rockridge Rock. It’s at the bottom of this shot, in the middle. But the view south hasn’t changed. This is the cemetery’s back forty, looking nearly unchanged after 150 years. 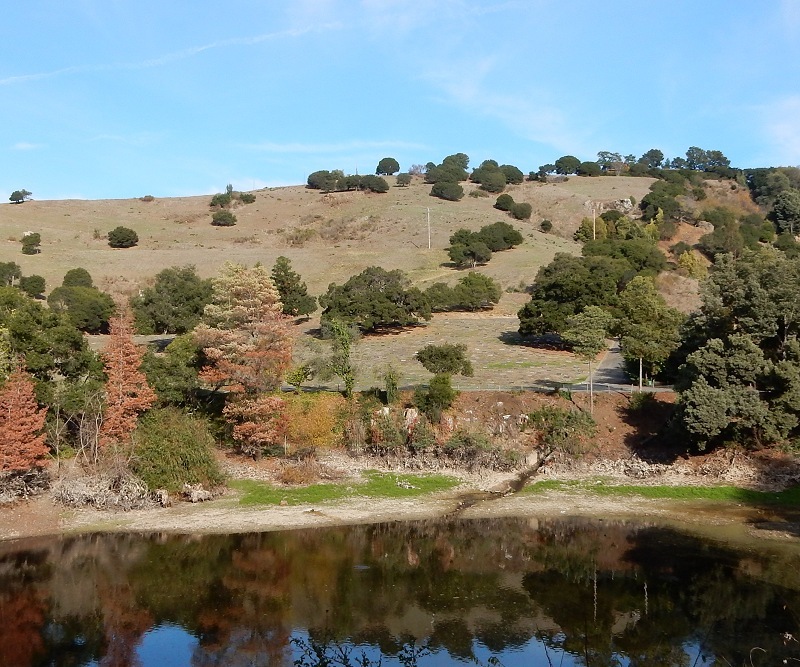 Here’s a look at it head on, over the uppermost of the three ponds that occupy the headwaters of Glen Echo Creek. It’s not fenced off, so it’s open to exploration. 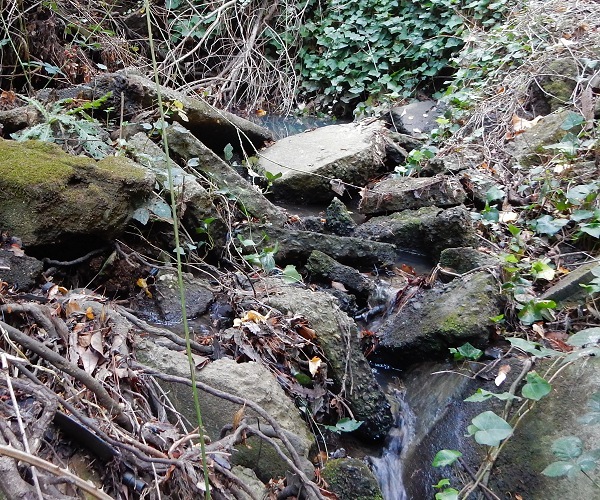 Up the course of the creek is another small basin, above which the creek briefly emerges from a culvert. This is its current birthplace. 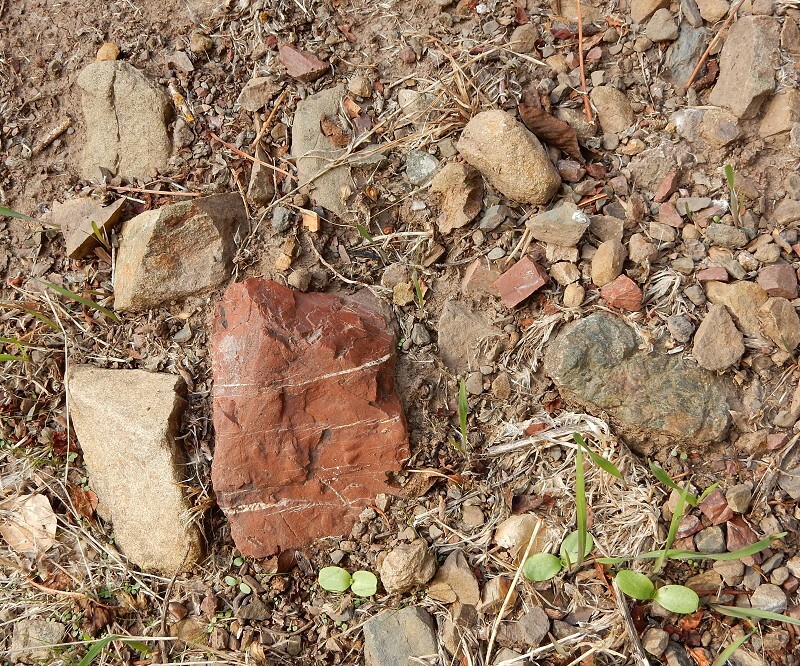 The hillside gravel here — what geologists call the float — samples several different rock types that occur in the melange. Red chert, graywacke and some sort of serpentinized thingy is visible just in this small footprint. There’s also green chert, greenstone and basalt around. Here’s the graywacke — a dirty sandstone — close up. And this is my favorite knocker (one of several) in the UNcivilized part of the cemetery. 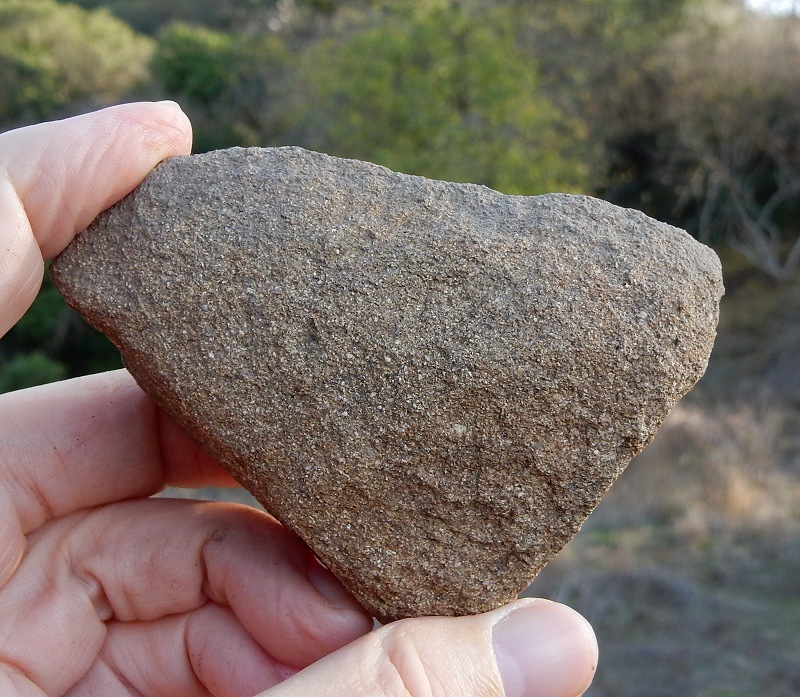 It’s made of the high-grade green chert, whereas the first knocker I showed is the classic red ribbon chert. 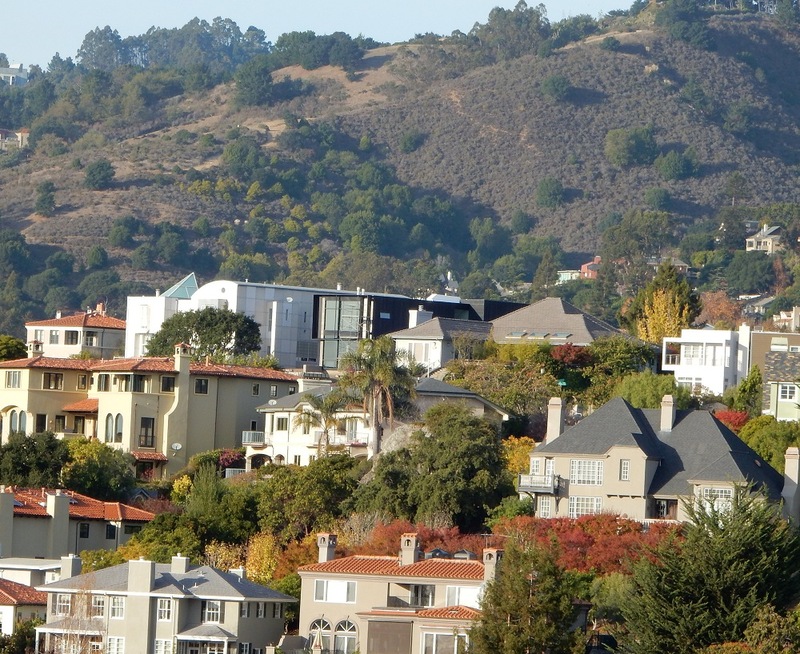 You could brave the traffic and see a huge expanse of it in the Marin Headlands, which is a nice field trip. Or you could stroll here and have it all to yourself, as long as I’m not hanging around. 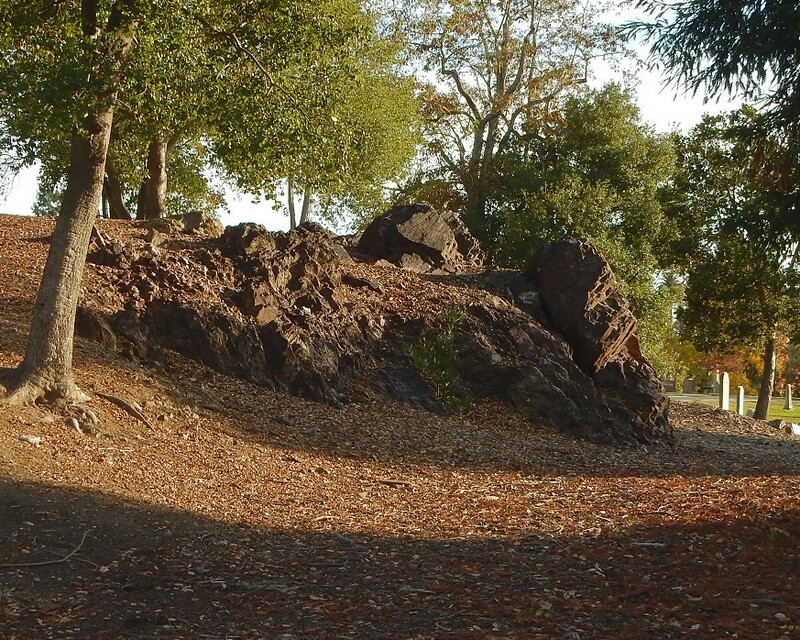 This entry was posted on 7 December 2015 at 8:03 am and is filed under Cemetery knockers, Franciscan rocks, Oakland chert, Oakland geology views. You can follow any responses to this entry through the RSS 2.0 feed. You can skip to the end and leave a response. Pinging is currently not allowed.